The First Battle of Adobe Walls. Texas | Columns | "Letters from Central Texas"
When historians talk about the Battle of Adobe Walls they are usually talking about the Second Battle of Adobe Walls because it featured an all-star cast of characters along with a dose of magic and mythology. 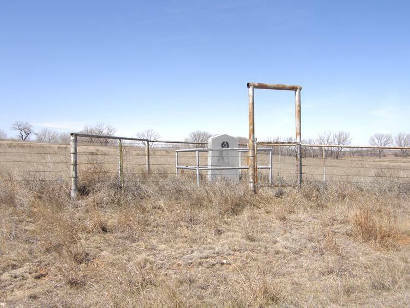 The scene of both battles, Adobe Walls, was as a wilderness outpost for soldiers, buffalo hunters and anyone else brave or foolhardy enough to venture onto the vast and untamed Llano Estacado in the early and mid-19th Century. The Second Battle of Adobe Walls featured chief Quanah, later to be known to whites as Quanah Parker, and buffalo hunters like Bat Masterson and Bill Dixon, who shot and killed a Comanche from a distance of nearly a mile away with a big Sharps .50 buffalo rifle. The First Battle of Adobe Walls occurred some 10 years earlier, in November of 1864, and featured a man who was a legend in his own time and who was actually deserving of that reputation. 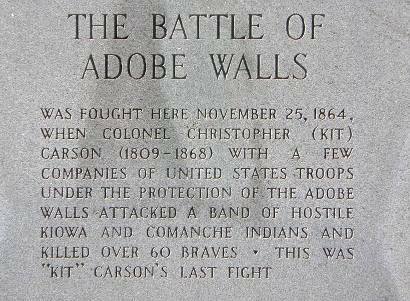 "The Battle of Adobe Walls was fought here November 25, 1864"
Kit Carson grew up in the Western wilderness and was a bona fide mountain man before he was 21 years old. He served as a guide and hunter for John C. Fremont�s initial explorations of the country and it was through Fremont�s published journal that Carson became famous as the quintessential mountain man. The government hired him as an Indian agent for a while � he had both married and killed Indians and so seemed a natural choice � but he disliked the bureaucracy of the job and resigned to serve with the First New Mexico volunteers. 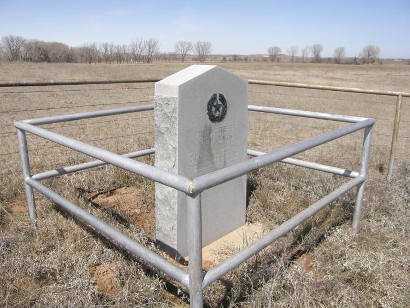 In that capacity he was sent to Texas in 1864 to find and punish, with extreme prejudice, the Comanche and Kiowa who were making life miserable and death a real possibility for wagon trains on the Santa Fe Trail. Carson followed the Canadian River onto the Llano Estacado, or Staked Plains, where no one, not even the Texas Rangers, had ever ventured in pursuit of Comanches, the fear being that they might actually find them. Carson took on the task as a practical matter and employed Navajo and Apache scouts as he followed the Canadian River in search of marauders. Such an expedition, under most any other commander of the day, would have been an abject and bloody failure. Even with Carson in charge it almost turned out that way anyway. After routing a Kiowa village on the banks of the river, Carson and his men moved to a large Comanche village and wheeled the howitzers into place. When the inevitable Comanche charge came, the howitzers gave the warriors a cause for pause before they embarked on a full-scale retreat and a change of strategy. When they attacked a second time they spread out in order to make the howitzers much less effective. Between attacks, the U.S. soldiers heard the sound of a bugle being played with considerable skill from somewhere within the enemy ranks. When the U.S. bugler sounded �charge,� the Comanche bugler � perhaps chief Santanta � would play �retreat� and visa versa. It was a bit of comic relief in what turned out to be a bloody battle. The subsequent Comanche attack was relentless and, Carson noticed, aided in no small part by a steady stream of reinforcements riding into the fray from a much larger Comanche village that he and his scouts could now see clearly. By afternoon, some 3,000 warriors had joined the battle. This was similar to the blunder that George Armstrong Custer would later make at the Little Big Horn, the difference being that when Carson�s scouts told him he should leave that place or die there, he listened. The troops retreated but the Comanches now outnumbered Carson and his men by 10-1. Carson again unleashed the howitzers, and that weapon alone allowed Carson and his soldiers to make good their escape under cover of darkness. The U.S. military claimed the battle as a rousing victory but Carson didn�t quite agree. Without the howitzers, he said, �few would have been left to tell the tale.� This was to be the last battle Kit Carson would ever fight. Despite what the official report said, Carson would say, �The Indians whipped me in this fight.� As usual, he was right. "This one was hard to get permission to see. 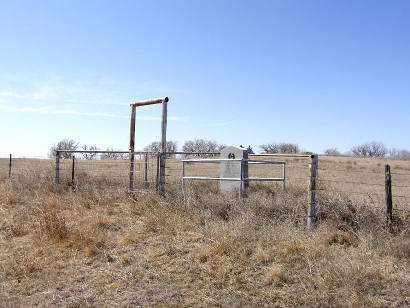 It is located on private property about 1/4 mile west of the other markers." More "Letters from Central Texas"